The hotly anticipated box office duel between the Zhang Yimou/Christian Bale historical epic The Flowers of War and the Tsui Hark/Jet Li wuxia action pic Flying Swords of Dragon Gate came to a head last week with solid but not record-breaking results. Both films did brisk business, with Flowers pulling in $23.9 million versus Flying Swords’ $22.3 million, but their producers were undoubtedly hoping for more. With its reported $91 million budget, Flowers of War needs to do Avatar-sized numbers (that film cumed $208 million in China in 2009-10) to have a profitable theatrical run, but it failed even to exceed the opening of the $1.4 million budgeted Love is Not Blind, which took in $28.5 million in its opening week back in early November. Although it’s too early to say for sure, it looks unlikely that Flowers will break $100 million in Chinese ticket sales, much less the $200 million it needs. Given its limited international prospects due to its dark and China-specific subject matter, Flowers could earn the unwelcome distinction of becoming the biggest money-loser by far in China this year. Bona Group’s Flying Swords also slightly under-performed relative to expectations, but with its much lower $35 million budget and its stronger international appeal, it will be much more likely to recoup its investment. Both films will be pinning their hopes on a strong finish to 2011; as in many other territories, the last few weeks are traditionally among the best of the year in China. Overall, box office totaled $50.8 million for the week ending December 18th, a 34 percent increase over the same week last year, when Let the Bullets Fly began its record-breaking run with a $27 million opening. It was also a 122 percent jump from last week’s $22.8 million. 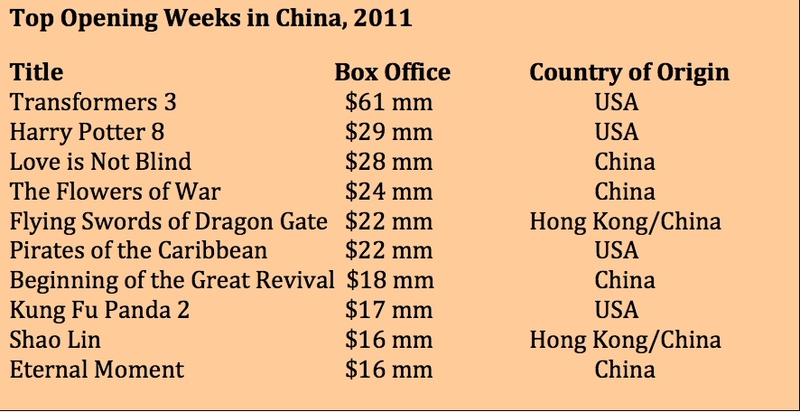 Flowers’ and Flying Swords’ respective box office performances made for the 4th and 5th best opening weekends of 2011, and together with The Adventures of Tintin they raised the count to 30 films that have grossed $20 million or more in China since January 1st. By my tally, as of last Sunday the PRC’s total box office for 2011 now stands at $1.92 billion, with 13 more movie-going days to go. If Flowers and Swords hold up, as I expect they will, and if the year’s remaining 9 new releases do at least a fair amount of business, China will exceed $2 billion for the first time. Considering that total national box office was less than $200 million just 7 years ago, that would be an auspicious way for the film industry to enter the new year. Robert Cain is a producer and entertainment industry consultant who has been doing business in China since 1987. He can be reached at rob@pacificbridgepics.com and at www.pacificbridgepics.com. This entry was posted in Analysis, Box Office Reports and tagged Avatar, China box office, Christian Bale, Flowers of War, Flying Swords of Dragon Gate, Jet Li, Rob Cain, Transformers: Dark of the Moon, Tsui Hark, Zhang Yimou by chinafilmbiz. Bookmark the permalink. Could the better figures overall for the year compared to last year simply be a reflection of the rush towards many brand new theatrical venues? Senthil, yes, the huge increase in the number of cinemas has been a major factor in China’s rapid growth over the past several years. There are hundreds of cities without modern multiplexes, so I expect the majority of China’s growth in the next 5-10 years will come from new venues.